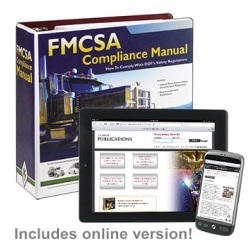 The perfect resource for anyone managing or operating commercial motor vehicles (CMVs). With Online Edition, access this content from any browser or mobile device within minutes of completing checkout - see Online Edition tab for details. Loose-leaf, 3-ring bound, 850+ pages. 5-Year Update Service 38976 — $807.00 (Buy 3 Years Get 2 Free) BEST SAVINGS!